Home › Invent to Learn Guides › Making in the K-3 Classroom › The Invent to Learn Guide to K-3 Making in the Classroom: Why, How, and Wow! The Invent to Learn Guide to Making in the K–3 Classroom: Why, How, and Wow! is a practical guide for primary school educators who want to inspire their students to embrace a tinkering mindset so they can invent fantastic contraptions. Veteran teacher Alice Baggett shares her expertise in how to create hands-on learning experiences for young inventors so students experience the thrilling process of making—complete with epic fails and spectacular discoveries. In this full-color book loaded with photos, Alice provides ideas, resources, and practical advice about learning space design, plus gathering materials and doing more with less. STEM curriculum objectives and connections combine with inventive open-ended challenges for grades K–3 with programming, electronics, and 3D design. The rapid changes in technology coupled with Alice’s desire to help her young students create and not just consume led her to incorporate as many building challenges within the curriculum as possible. Before long, she had a closet full of motors, LEDs, pom-poms, and googly eyes. Her students consistently wow with their wacky inventions and technological fluency. This book is aimed at educators of primary school students who want to teach STEM and other subjects in a hands-on, minds-on way that engages and delights. 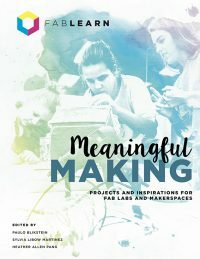 The maker movement is sweeping through schools and the nation, and this book is an essential guidebook for joining in the fun! Buy The Invent to Learn Guide to Making in the K–3 Classroom: Why, How, and Wow! from Amazon.com and other online retailers. For volume sales and discounts, PO purchases, or international sales, contact CMK Press. This book will be available from local distributors in the U.S, Australia, and the U.K. The book is available from Amazon.com and major online retailers worldwide. Learn more about The Invent to Learn Guide to Making in the K–3 Classroom: Why, How, and Wow! on the Constructing Modern Knowledge Press website. ‹ White House here we come!